The public is invited to an open house at the Wyoming State Geological Survey (WSGS) to view the rare mammal fossil discovered near Kemmerer. The open house will be 9 a.m. to 4 p.m., Sept. 24–28 at the agency’s office on the University of Wyoming campus in Laramie. The event will wrap up with a final viewing 11 a.m. to 3 p.m., Saturday, Sept. 29. The fossilized tapiromorph will then be taken to the Wyoming State Museum in Cheyenne for display beginning in early October. There will be an open house at the museum Oct. 4 from 11 a.m. to 2 p.m. The fossil is the largest known mammal discovered in the Fossil Butte Member of the 50-million-year-old Green River Formation, and it is the first of its kind found in the geological formation. The specimen is potentially a new species and may support a North American origin of tapiroids, or tapir. A tapir is a large, plant-eating mammal most closely related to rhinoceroses or horses, but it resembles a pig and anteater. The modern tapir typically inhabits jungles and forests in South and Central America and Southeast Asia. Rick Hebdon, owner of Warfield Fossil Quarries, collected the fossil in 2016. The specimen consists of four large slabs with fossil material encased in rock, and a box of smaller pieces. The upper skull is missing, but the lower jaw and teeth are intact. There is high quality preservation of the hind legs and feet, and a front leg and foot are well preserved. Bones from the hip area are present. Also, the ribcage is not as well preserved and is inundated with roots. 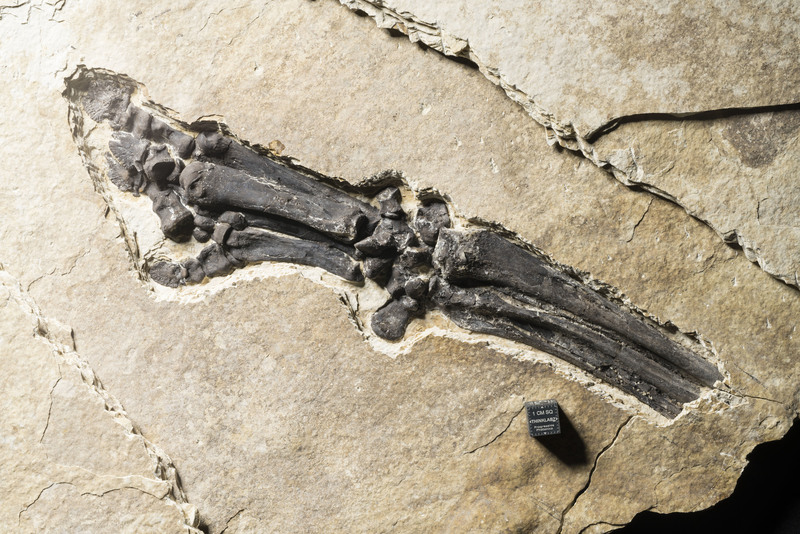 The fossil was found on a state-leased quarry, and because it is a rare specimen, it was turned over to the State of Wyoming, following Office and State Lands and Investments fossil permit regulations. The WSGS serves as a repository of state-owned fossils. The late Dr. Gregg Gunnell, paleontologist and former director at the Duke Lemur Center, identified the fossil as a tapiromorph. The WSGS hired researcher Mike Eklund of Illinois to prepare the fossil for scientific purposes. Eklund conducted his work under a microscope with time-lapse photography. Photos and time-lapse videos of the preparation process can be viewed on the WSGS website. 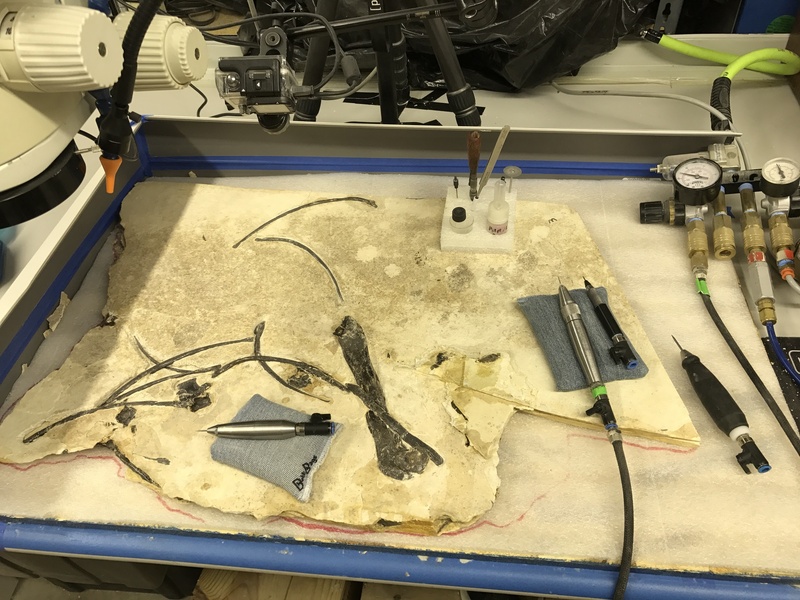 “The time-lapse videos of the fossil preparation are fascinating, especially with the finished fossil for comparison,” Campbell notes. The WSGS website includes information about tapirs, photos taken during the fossil’s preparation, and X-ray and CT scan imagery of the rock slabs taken at Ivinson Memorial Hospital and Stiches Acute Care Center prior to the preparation. Cutline (above): Preparator and researcher Mike Eklund successfully removed the matrix around what appears to be the complete foot, ankle, and lower leg anatomy of the tapiromorph specimen. Cutline: Mike Eklund prepared the specimen under microscope and had a camera(s) set to take photos every minute. The photos were compiled into a time lapse showing the progression of preparation on each of the tapiromorph slabs. See the time-lapse videos on the WSGS website at http://www.wsgs.wyo.gov/wyoming-geology/tapiromorph-fossil. This is a test for the Survey news release system.